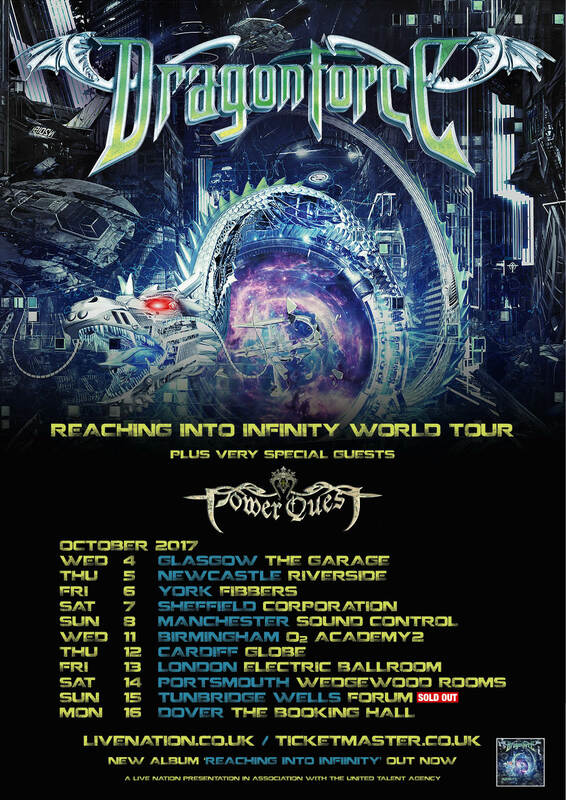 Currently in New Zealand halfway through their Reaching Into Infinity World Tour, DRAGONFORCE have revealed some very special guests for the UK leg. Joining them on the 11 UK shows will be old friends POWER QUEST, who release their new album ‘The Sixth Dimension”on Friday October 13th which is available for pre-order here. Having shared members – with both members of DRAGONFORCE performing in POWER QUEST and vice versa – the two bands have a rich and colourful history that will make for an easy alliance on the road. These will be the first UK headline shows after the release of their brand new studio album, ‘Reaching Into Infinity’ out on May 19th. The tour will kick off in Glasgow on October 4th. ‘Reaching Into Infinity’ is out now on earMUSIC and is available as standard edition, special edition including two bonus tracks and a multi-angle bonus DVD as well as vinyl. Previous REACHING INTO INFINITY OUT WORLDWIDE TODAY!